Tregarthens book is mainly a college textbook. In high schools, it should be assigned to honor students; for other high school students the instructor will need to eliminate a lot of material. 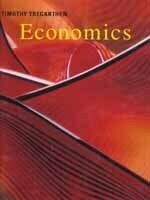 Otherwise, it is solid; students who master this book are well on their way in the study of economics. The author discusses issues in a way that compels the student to consider opportunity costs, unintended consequences, incentive changes, and so forth. For example, when discussing shifts in the level of income inequality, Tregarthen writes, "While some people conclude that this increase in inequality suggests that the latter period was unfair, others want to know why the distribution changed." This is precisely the way an economist should approach questionsseeking explanations rather than dispensing judgments. Another good example: The extreme pollution problems of much of eastern Europe and Russia are laid at the foot of Marxs labor theory of value. "Since natural resources arent produced by labor, the value assigned to them was zero," Tregarthen observes. "Soviet plant managers thus had no incentive to limit their exploitation of environmental resources, and terrible environmental tragedies were common." However, other things are missing. For example, the very important observation that discrimination tends to impose costs on firms that practice itand that it creates opportunities for those that dont  is missing. The treatment of entrepreneurship in the book is disappointingly slight. He gives no profiles of successful entrepreneurs.